Aw, shucks. While episode 17 really did have me laughing through the melodrama, I couldn’t seem to do that with this episode. Soulless Zombie Chang Hee has now become evil, bitter monster Chang Hee. Hae Joo…proves once again that she can be a complete idiot and has a blatant disregard of herself over others. Really, the saving grace of this episode was when the Chun family got into a fight with the Jang family. and feel the heat of the future’s glow. when it keeps finding ways to get to your heart? It reaches way down deep and tears you inside out til you’re torn apart. 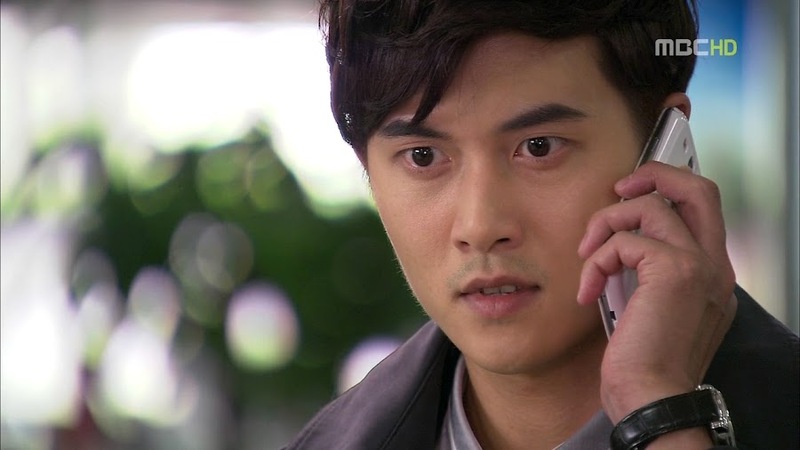 We begin episode 18 of May Queen at the airport with Chang Hee getting upset at Jang’s text and throwing Hae Joo’s phone to the floor, breaking it. This really shocks here. Just what is going on with Chang Hee? He’s not acting like the man she knows and loves. Chang Hee tries to plead with her, but to no avail. Hae Joo walks out on him. He then gets another call from Jang and he tells the older man that he has Hae Joo’s phone so its not like Jang can reveal the full truth to her. Jang then reveals Gi Chul’s sorry state. Gi Chul weakly tells his son to keep going forward and to forget about him. Jang, however, is doing his best to bait Chang Hee to come back. Chang Hee then rushes outside to catch Hae Joo, not noticing she was on the bus until it had already started to pull away. He runs after it (because this wouldn’t be a Korean drama without someone running after a bus) only to be stopped by two cars full of Jang’s men. Of course, Chang Hee will NOT go willingly. The onlookers watch on as he is surrounded and he does his best to fight off the men. 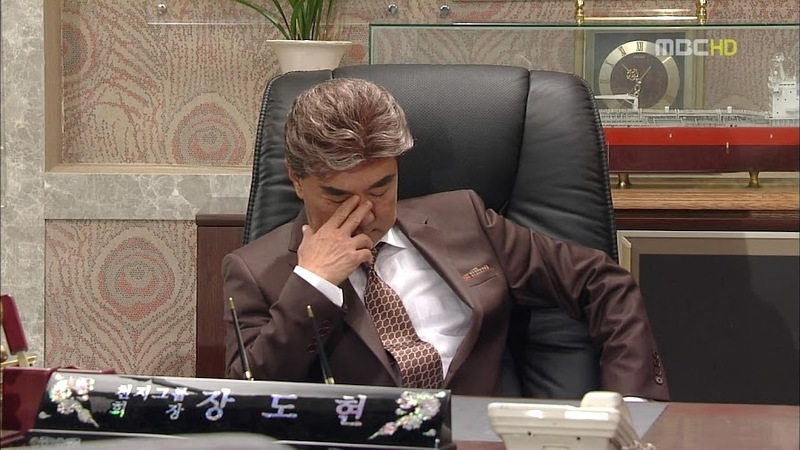 However, Jang’s secretary gets the best of him. He then shows Chang Hee a picture of his beaten and bloody father. Well, thanks to Hae Joo rejecting Chang Hee…what does he have left? Nothing. See, I think Chang Hee should have opened up a bit about the situation. Hae Joo might have saw things differently enough…but then again, probably not. Hae Joo actually isn’t all that understanding of how others feel. She really isn’t. I don’t know if she’s really that…un-empathetic…or if she is willfully ignoring the feelings of others. Sure, Chang Hee is no better as he never really understood Hae Joo’s position. For this reason alone this couple of 15 years was doomed to failure. Chang Hee enters Jang’s office and you can see it in his eyes—the monster has awakened. Sure he’ll play Jang’s slave, but if Jang thought Chang Hee was a bad puppy before, I wonder what he’ll think of the ravenous dog he’s riled? Got to love the irony—Jang keeps closest to him the very people who will (unless this really ends up being a craptastic drama) destroy them. I get the keep your friends close and your enemies closer statement, but at the same time…some enemies are better off far, far away—Monster Chang Hee is one of them. So the angry son after Jang’s gloating speeches, drops to his knees and “submits” to Jang’s rule. This makes Jang happy. And now that Chang Hee is complying with him finally, he has to talk about how much he has always liked the young man and how he admires Chang Hee’s pure love (well…more like obsessive or possessive, but sure, pure). I really could have punched Jang when he told Chang Hee that you have to choose sometimes between love and other matters. Oh, not because it’s not true, but just because you know he’s rubbing salt in Chang Hee’s wounds. But hey, keep beating your dog and just wait to see what happens. Seriously. Dogs snap. It’s bloody and vicious (and I don’t blame them one bit—although if we’re talking about animals, that usually leads to the poor thing getting put down). Hae Joo goes to her cliff to talk to her father. She did the right thing, right? For one moment she was tempted to hold on tight and follow Chang Hee. Um…shouldn’t we have at least seen some of this struggle at the airport? I mean, the girl didn’t look conflicted at all. She was just annoyed at Chang Hee’s attitude and “kidnapping.” But whatever. I had to laugh when she’s all like it doesn’t matter as she has her family. Okay. Family (for the most part) is a great thing. I’m very close to my own family. But Hae Joo and her unwillingness to live her own life is frustrating. I’m not saying she should 100% give up her family. I just don’t get why it has to be one or the other. Marriage (in a perfect world) is a combining of families into one, but Hae Joo seems to be of the opinion that it’s either love or family (Chang Hee is the same way, too…sighs). Sometimes, there also comes a point when you may have to leave your family for your own happiness. Chang Hee did (too late) get that (because you know he really does love his father), but Hae Joo seems to believe that she must sacrifice all of herself for her family and that is actually VERY unhealthy. She’s the queen of imbalanced relationships. I guess…in this way…it really proves just how alike she and Chang Hee are. They are too alike to be a successful couple. To make up for the melodrama we get more excellent scenes of Kang whipping (quite literally—okay, sans whip, but still) Sang Tae into shape. I LOVE it! Kang is doing what Dal Soon should have done years ago. Since she pampered her own children too much, they’ve come to be complacent, selfish idiots—especially Sang Tae. Young Joo has redeeming qualities at least—Sang Tae doesn’t really have any since he’s really selfish (although he does have some good moments where he somewhat considers others—like with Hae Joo’s birthday and the fight scene later). Had to love it when Sang Tae tried to crawl away and he was stopped on one end by Kang and by Secretary Kim on the other. When Sang Tae complains that he went to college, Kim points out that he studied overseas. Heehee. That trumps Sang Tae’s college degree. Meanwhile, San is doing some esearch that makes him very morose. 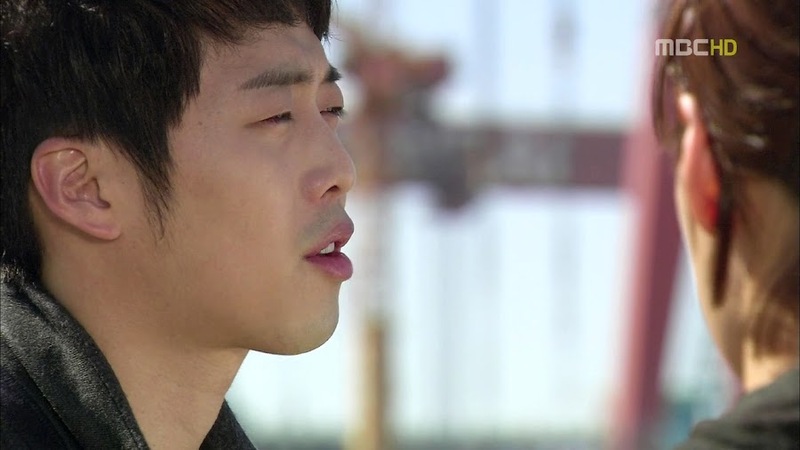 When Hae Joo comes to find him, he is staring broodily out over the water. At this time, the two actually have a real conversation. Hae Joo explains her love of boats stemming from her father and being able to forget her worries when on the water. San explains that he’s similar. He likes boats as they try to beat the ocean. That’s also why he wishes to build the azimuth thrusters. They keep a drillship in place regardless of what the ocean throws at it. He likes that they are able to beat the ocean at its own game (anyone else wonder if he has some grudge against water to go along with his fear of flames and heights?). San also voices how he’s envious of Hae Joo for having her family and her memories of her father. Hae Joo wonders why he just doesn’t ask his grandfather again. San can’t. He knows that no matter what happened between father and son, Kang has been through a lot of turmoil and pain. San doesn’t want to keep adding on to that. Then Hae Joo says something completely brainless. Wow. She was wrong about San. He’s suffered, too, hasn’t he? I face-palmed at that comment. How ignorant can that girl really be? Sure she didn’t spend enough time with San when they were younger and he was always bright and cheerful…but to honestly think the man never suffered? And I shall again bring up Hae Joo completely forgetting what In Hwa told her 15 years ago. In Hwa told Hae Joo about San being an orphan and being raised by his grandfather. Even if San has received all the benefits and love possible—don’t you think growing up without his parents is a type of suffering? Of course, Hae Joo only focused on the fact that San was Kang’s grandson and heir to a shipbuilding plant. I also don’t want Hae Joo to start falling for San like she did with Chang Hee—because they both suffered. That would be wrong and not fair and just lead to the same problems repeating themselves only with different people. Anywho, enough griping. Chang Hee returns home where Gi Chul demands to know why his son came back. Chang Hee does say that there was no place left to go if Hae Joo wouldn’t be with him and Gi Chul yells wondering why his son couldn’t even be man enough to convince her. Chang Hee then announces he will become Jang’s dog, and do everything his master tells him. But he won’t end up like his father. Chang Hee vows to become bigger than Jang and watch as the man loses everything. 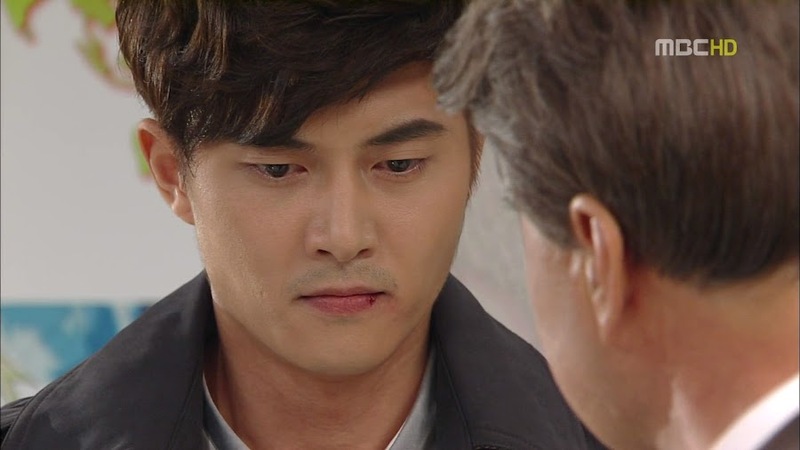 Gi Chul at witnessing his son’s darkness coming to the surface can only sob like a baby. Meanwhile, his son goes out with his box of letters. Chang Hee reads two. One where Hae Joo is happily congratulating him on his college entrance and taking first. The other talking about how she isn’t happy at all that he’s become a prosecutor really. Oh, wow. You know, if I was Chang Hee and had received that second letter he read, I would have thought twice about my relationship then and there. I do get it as Hae Joo felt worthless and smaller and smaller, but to actually write what she did was rather insensitive to the young man who was working hard in a different way. 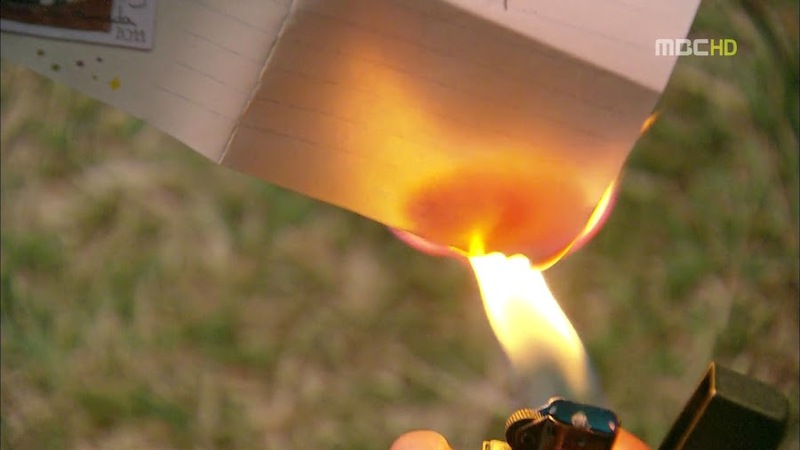 Chang Hee burns all the letters. How ironic. He’s burning his past with Hae Joo in the same spot where Geum Hee burnt her past with Yoo Jin. But will either of them ever actually be able to forget? Sang Tae is lying on the outdoors table and grumbling about his aches and pains when San and Hae Joo arrive. Sang Tae immediately lights into San who tells his friend to put up with Kang for a month and he will be the better for it and have an even more promising job. Hae Joo then says that after awhile, Sang Tae should be able to see the fruits of his labor and be content to be doing something worthwhile. Not really, the boy insists on quitting which makes Hae Joo and Dal Soon chase him around, trying to beat him. LOL. San goes to leave and asks if she and Chang Hee are doing okay. She can’t say anything to that. San knows that there is still a problem then, but he has no idea that their relationship was ended since Hae Joo refuses to talk to anyone. Hae Joo calls up Chang Hee on her house phone and arranges to meet him. He’s at the meeting spot recalling his first meeting with the young girl when Hae Joo shows up. I can’t believe she has the gall to act as if everything’s okay. She urges him not to be upset about what happened earlier. Chang Hee then steps in and says that moment was their last. It was their official end when Hae Joo chose her family over him. Hae Joo immediately goes to say that Chang Hee knew this about her when Chang Hee cuts her off and he basically says everything that Hae Joo has always felt. He tells her that she isn’t right for him and can’t help him at all with her 10 certifications. He also calls her an idiot who can’t understand the situation (true). Hae Joo tries to get him to stop (calmly, always calmly) saying that his words will hurt him more than her in the long run. Chang Hee doesn’t stop. Hae Joo can’t even feed her starving family and all of her hard work is useless. Omo. Great. Welcome Monster Chang Hee. Hae Joo until that point hadn’t really been taking him too seriously as she knows he was trying his best to make her angry and get her to stop loving him, but after those final words, she couldn’t keep that mentality. Chang Hee begs her to never appear before him again and walks away leaving Hae Joo who had become a statue. Seriously. She didn’t move at all and only stared blankly. This is a change from her usual blank expression with wide eyes. And somehow that final shock was too much for our strong girl. She gets really sick the next day. Jin Joo calls in Dal Soon worried, and Dal Soon actually was going to rush Hae Joo to the hospital, but her adopted daughter wouldn’t hear of it. Why? She needs to work to feed her family so they can survive. Great. Hae Joo already had a complex and Chang Hee just compounded it. So Hae Joo being Hae Joo idiotically gets dressed and goes to work when she can barely stand (and at this scene, I have scenes from other shows running through my head where a person’s sacrifices were called out as being stupid as no one asked them to go as far as they did—I think even though her family depends on her, the Chuns would have the same mentality in the long run). Jin Joo reveals that Chang Hee met with Hae Joo the night before and after that Hae Joo seemed completely lost and ended up like this. Dal Soon calls up Chang Hee and asks what happened and Chang Hee said he broke up with Hae Joo like her mother wanted and to please never contact him again. 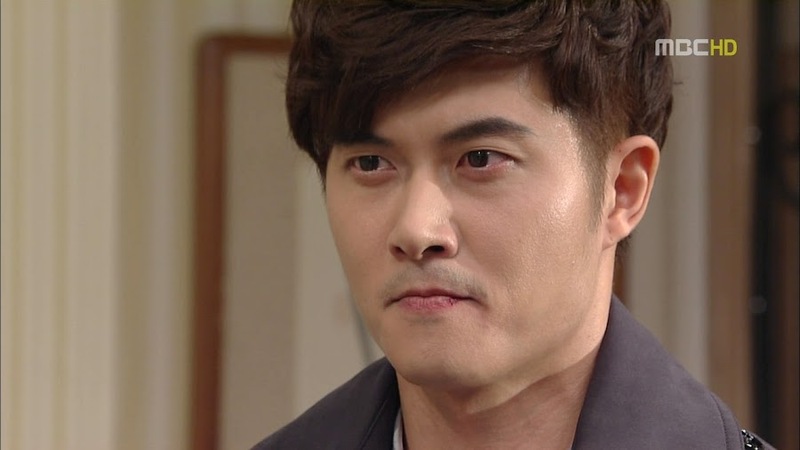 Dal Soon immediately becomes enraged and has Jin Joo wake up her brother. They are going to pay that kaeseki (Korean swear word basically meaning SOB) a lesson. So we end up with a HILARIOUS scene as a result. The whole Chun family (minus Hae Joo) arrives at the Jang estate to confront Gi Chul and Chang Hee (who is out on business). Enter the Jang clan (minus Bong Hee and Geum Hee). What ensues is total chaos of hair pulling, biting, kicking, hitting, scratching, and Dal Soon going after Jang with a broom (with him backing away in total shock defending himself with a garbage lid). Bong Hee and Geum Hee finally come out and Bong Hee can only laugh at the spectacle. Gi Chul then manages to get away and get the butlers. When Jang goes to have the entire family arrested, Geum Hee says he can’t as they are Hae Joo’s family. So everyone ends up in the Jang household looking like kids in a school fight. Jang remonstrates Dal Soon and Gi Chul for bringing their private matters to his doorstep. Bong Hee still can’t stop laughing and Geum Hee looks like she shares her husband’s opinion on the immaturity. I love how no one can quell Bong Hee except for Dal Soon. It’s kind of cute. Dal Soon upbraids Gi Chul for making her daughter miserable and for Chang Hee doing so as well. Her precious daughter was crying tears of blood and got so sick thanks to Chang Hee’s breaking up with her. Dal Soon then warns Gi Chul if Chang Hee ever comes near her daughter again, she will celebrate the young man’s death. LOL. You go mama! The Chun family then leaves—their pride in tact for having come together to defend their precious Hae Joo. 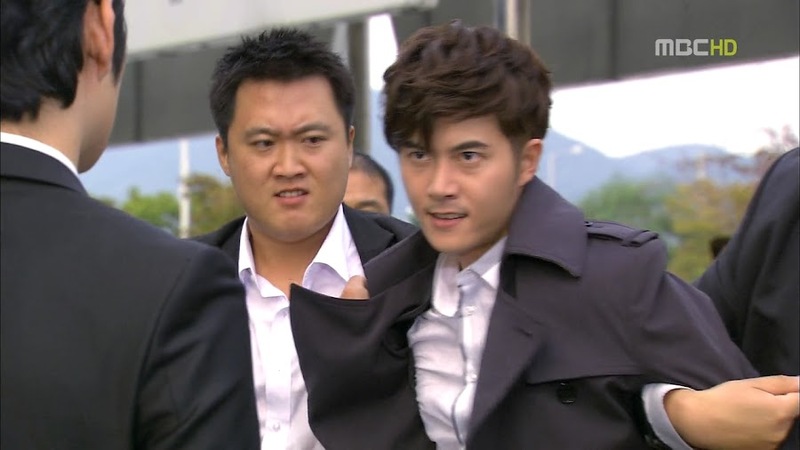 At the office, Jo and the others continue to bully Hae Joo. How anyone can NOT notice how sick this girl is beyond me. She finally gives Jo the report Jo has been complaining about for several episodes now and Jo takes one glance and immediately says Hae Joo doesn’t have a good brain due to her idea and its explanation. She is then told to change the water jug. Hae Joo struggles to do this when San comes in and takes it from her. He complains its heavy and then foists it off on Jo. He does then take it back and easily lifts it into place. A man should be able to do that much, right? Got to love how he slams the two people who bully Hae Joo the most. He then asks why his worker didn’t answer her phone. It broke. San then takes Hae Joo to get her phone replaced. He teases her as normal, but given how she’s feeling, Hae Joo won’t have any of it. San does finally notice her pallor and how ill she looks and he’s immediately concerned. Of course, Hae Joo doesn’t want his concern (or his money has he tried to pay for the phone) and demands only one thing of him—take her to his factory so she can do some manual labor. The worried San complies and has to stop Hae Joo from interfering with his grandfather’s treatment of Sang Tae. Seriously? I know she doesn’t like people picking on her family, but she should know that Kang is doing this all for her older brother’s own good. San tells her to bear with it as Sang Tae should have enough training for a certification at this rate after only a month. 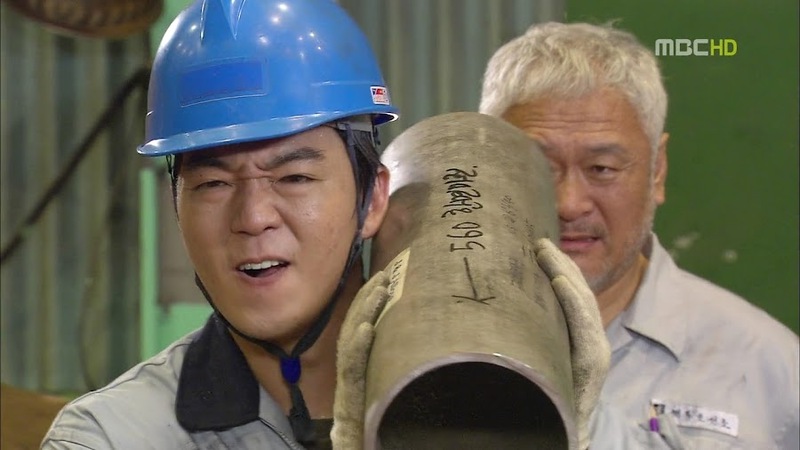 Hae Joo then tells a welder he isn’t doing the welding properly and she does it herself. Only she nearly passes out and then breaks down and cries. Why is even that welding equipment not listening to her. Up goes San’s concern even more. They then go back to his place where Hae Joo just lies on the coach for a nap. Meanwhile, Monster Chang Hee is in full on evil mode now. He goes to the contractors and basically uses a son’s gambling addiction and one’s infidelity to his wife to keep them from going against Jang. Well, besides blackmail, he does offer compensation of course. Masterfully played, masterfully played. Evilness suits you. Chang Hee then reports his success to Jang with his lifeless zombie expression. Jang congratulates him and says this is why he’s cherished him (riiight). Jung Woo then learns what happened and is livid. How can they prosecute Il Moon after being so expertly blocked by Chang Hee? Oh, and Jang wants Chang Hee to help rid him of Jung Woo for good. Omo. I don’t think so. He’d better not touch Jung Woo at all. San has taken Hae Joo to his bedroom and is diligently taking care of her. He scolds her for not leaning on him like she said she wanted to. He even offered to be there for her unconditionally. But still…at least he gets to be close to her like this. Hae Joo then moans “oppa.” San immediately says he’s there and asks what’s wrong. Only it’s not him she’s calling oppa. She’s begging Chang Hee not to leave. Need you any more proof that things are rotten in Denmark, San? Sang Tae gets home and collapses once more. He orders Young Joo to make him food and the younger girl asks him if it isn’t possible that Hae Joo was adopted. Young Joo doesn’t remember things clearly, but it seems like Dal Soon was always mean to Hae Joo when they were younger. This earns her a scolding from Sang Tae, but after she leaves even Sang Tae begins to have his doubts as he recalls the past, but he shakes himself out of it. That’s impossible, right? Bong Hee is also surprised to learn what Chang Hee did. She then reveals the funny antics of that morning and Jung Woo has heard enough that his precious adopted niece has suffered thanks to Chang Hee completely breaking things off. Bong Hee realizes he’s stopped listening to her and stops talking. Typical Jung Woo. At this time, Hae Joo wakes up after recalling the accident and the license plate text. She demands that San take her to see her uncle right away. We then cut to In Hwa who has gone to a bar to drink. She meets Chang Hee and immediately lights into him for not being a man who could protect his woman or stand up for his own happiness. After being ridiculed by her, what does our drinking monster do? He forcefully kisses her (after she slaps him) and that makes her slap him again. He deserved that. We all know what his revenge plan is and that it will involve using In Hwa to get to Jang. Good choice. He has always seemed to favor her over his son. Geum Hee is at the hospital undergoing a routine physical I guess. The doctor tells her that she has a weakened immune system and should get a pneumonia shot. Bong Hee immediately agrees to this despite her older sister’s protests. She gets the shot and the doctor comes and tells her that everything appears okay in her blood work. He tells her that she doesn’t just have AB bloodtype, but a special AB type in which your children can inherit almost any bloodtype. Geum Hee, shaken, asks if its possible for her with her special AB and a husband with O to have an AB child. The doctor affirms this. Okay. Now I admittedly know nothing about bloodtypes (heck, I don’t even know what mine is at the age of 27), but why would she automatically think Hae Joo couldn’t be her daughter because she’s AB? I would think that even given the husband’s type, couldn’t an AB give birth to another AB? Again, ignorance speaking here. Hae Joo and San arrive at Jung Woo’s office and her uncle broaches the subject of her breakup. This surprises San, but definitely explains Hae Joo’s mood swings and crying jags and feelings of utter worthlessness. Hae Joo puts that subject aside and asks after her father’s case. Jung Woo confirms they never found the culprit and that the statute of limitations has since passed so the person couldn’t be arrested and tried. Jung Woo then reveals that Chang Hee took everything with him related to the accident saying he was going to investigate it further. 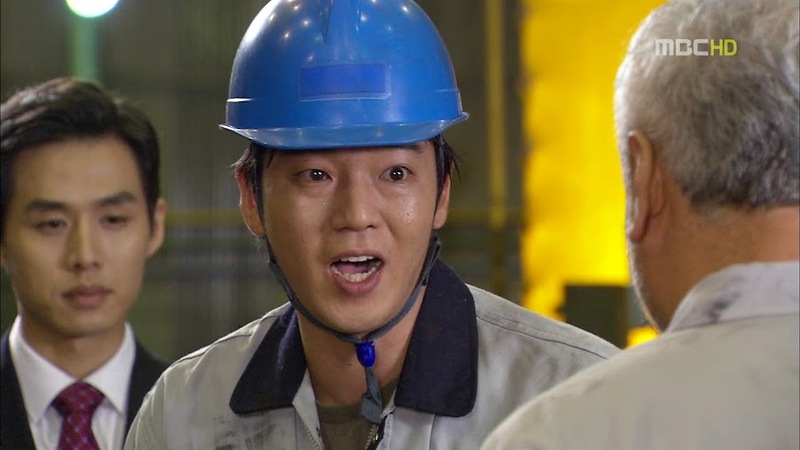 Given Hae Joo’s wide-eyed shocked face (really, doesn’t HJH have any other expressions?) does she have an inkling of the real reasons behind Chang Hee’s subsequent breakup? Ah, progress. That’s what I’d like. Can we quit hovering around these secrets that we’ve been dancing around from the past nine episodes? LOL I cannot get enough of your recaps! I find myself always refreshing this site! Chang Hee is pretty scary now.. And Hae Joo is just blah! Bring back old Hae Joo please! And I agree I want Hae Joo to fall in love with Kang not because of the same reason she fell for Chang Hee..
I’m glad you enjoy them 🙂 I try to get the latest May Queen recaps up on Sundays and Mondays, but I was out of town on a business trip last weekend and this past one was spent with my adorable niece and nephew, so a bit of a delay. 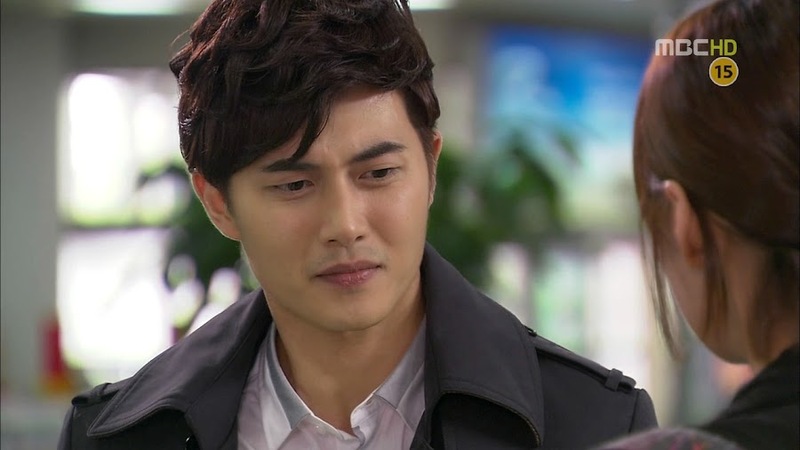 Jae Hee ROCKS evil Chang Hee. I am impressed by just how real and scary he is. Kudos for him as his more emotional heart-felt pain-filled scenes…sometimes fell flat even though he’s a pretty good actor. Here’s hoping Hae Joo really falls for San because he’s the one who will support her when she needs, urge her own dreams, and do all he can without demanding she choose him over her family…how ironic he’s the complete opposite of Chang Hee, but I’m sure that was planned. To be honest, this show is starting to bore me out so badly. And where is the romance between San and Hae Joo? It is further away than Pluto! Yes, the plot is getting tedious & the acting doesn’t help matters. Who knows, in 14 more episodes, the romance might come. Whether or not its believable is another thing. “queen of imbalanced relationships”!! i was rolling with laughter. Thanks for the recap, it made my day. No matter how bad the series progresses, i would stick to it (blame my undying love for Kim Jae Won). I’ll stick with it to the end as well no matter how bad it gets. Isn’t that funny how that works? To answer the thing with the blood type – it actually isn’t possible for a child from a AB and O(O) blood type parents to be AB (and there’s no such thing as ‘special’ AB). The child could only be either A(O) or B(O). What does make you so confident? Every rule has exceptions. Even in medical cases. Thank you! I probably should have studied harder in hs bio, but I don’t think we ever covered blood types… We did talk about genetics in general and dominant traits, but not blood types. Today I was looking for a good MQ-recap and found your site. I love your recap! You spoke totally my mind! “…only stared blankly. This is a change from her usual blank expression with wide eyes.” hahaha. So true!! Nothing against a wholesome drama-character. But this actress annoys me with her lacking skills more and more. Add these poorly written dialogues/scenes (Huh…really?! You suffered?!) and my rooting for this Hae Joo-character shrivels into nothing. Fortunately after all these suffering and headbanging through new episodes of MQ Wednesday and Thursday arrive and therefore new eps of Nice Guy!! Interesting main-characters, good acting, great music (!) and the storyline keeps unpredictable and free of dragging. Welcome! I’m glad you are enjoying the recaps. I am having problems with the adult Hae Joo as well. They could have found a better actress to play her. She didn’t annoy me too much at first, but the more she’s on screen, the more I find her lacking. As for the dialogue, I have heard worse cringe inducing lines, but that one right there just made me want to face palm. San has the patience of Job with her and I’m not 100% certain she actually deserves it. 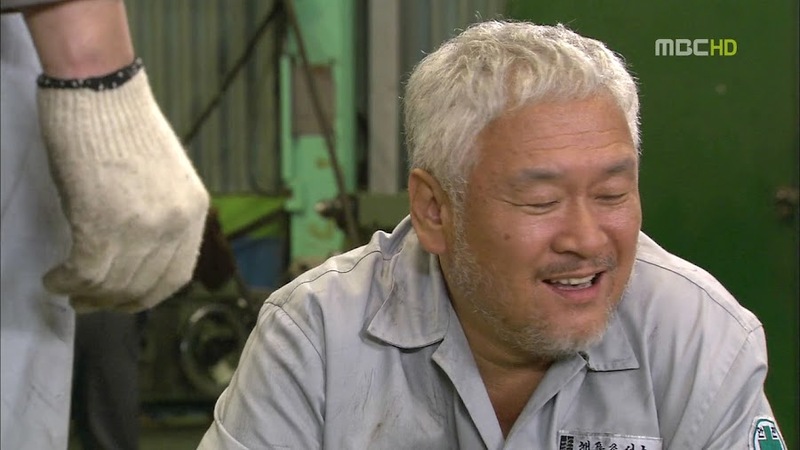 Ah Nice Guy, I watched one episode (with badly done subs) and enjoyed it, but haven’t watched any more since, so I haunt Mad Dino’s Asylum for that drama. Your comment makes me think I should try to squeeze it in again sooner rather than later. The last ep yesterday blew one’s mind! The story surprises on a regular basis left and right! I’m now playing episode catch-up 😛 Song Joong Ki is such an AMAZING actor in this role. I just love him. You are right, the plot definitely throws a lot of surprises your way. I think CH makes evil look good;) It’s obvious the actor thrives on those darker emotions because it showed in this episode. KS (and the actor playing him) is pure awesomeness all around, I just hate how he’s so hung up on HJ, running at her every beck and call when he’s waaay too good for her. He deserves to find happiness but she doesn’t deserve to have him. As for HJ, I think the character (and actress) hit an all-time low in this ep. There were so many ‘WTF WAS THAT? !’ moments with her, you’ve touched on them above, but what gets me most is her treatment of KS. She puts up with crap from everyone else, and yet the one person who has done the most for her benefit without any return she uses with no consideration – just look at everything he did for her in this ep alone! It’s hard to feel sympathy for her when she has so little empathy for others. Never mind the time jump, I say let’s get some amnesia up in here, it’s the only redemption I can think of for her at this point! I know, right? Jae Hee really embraces the darkness of Chang Hee and owns that character. It’s made up for his more lukewarm performance until now. 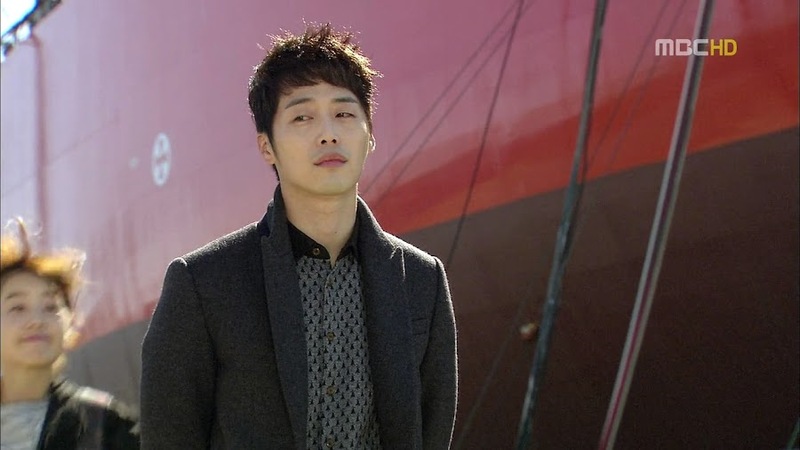 I agree that out of the main cast, it’s Kim Jae Won who shines all around. You want angst and pain? He’s got it. You want cute boy next door? You got it. You want the guy who’ll sacrifice everything for a woman who can’t see him and what he’s worth at all? You got it. He’s so adorable and loveable and, of course, smexy as hell. Aigoo. Hae Joo and Han Ji Hye. They did hit new lows in this episode. I was SO disappointed with her. Why does she only vent at San? Why must she be this super understanding unrealistic super woman to others? Poor San gets the brunt of all her pent up frustrations and anger and sadness that she normally keeps locked up. It’s good to let it out, but it’s like San’s becoming her personal whipping boy and she is completely oblivious to his feelings and concerns. It’s reaching the point where you want to throttle her in sheer frustration. Oh? You mean even the sunny San has suffered? That’s like looking at her back when she was a child and asking, so even the sassy Hae Joo has suffered. Well the blood type is important. Geum Hee is not AB, she have the type O but can pass the AB type. It’s not so rare if you have a AB grand-parent. AB + O –> O (AB) + O –> AB. There is a lot of kind of blood type. My father is AB and mother O –> I’ve got B with a weak rhesus (can be + or – if the test is superficial). You can have A, B, O or AB with a AB parent (idem for our Geum Hee special case: it’s AB but can be A or B). Thanks for the info, Joun. This is slowly starting to make more sense to me now. Thanks! I’ve read the article and what they were saying in the drama about her mother’s special AB blood type makes sense now. My brief stint with genetics was in hs bio and there we only really went into genetic traits being passed on vs. blood types.